Motorists near Machynlleth have been warned they could face disruptions for the next nine months while work to chop down giant trees take place. 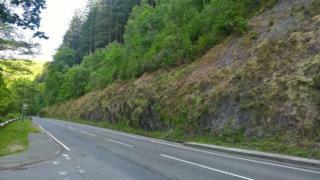 Natural Resources Wales (NRW) insist the 12 tonne trees towering above the A487 are too unstable. Traffic will be stopped in both directions "for up to 10 minutes" every time a tree is removed. NRW project manager Jared Gethin said: "We are sorry for the disruption, but our priority is to keep everyone safe." The work, which begins next week, is latest phase of a £3m scheme to remove unstable trees above the busy trunk road. Contractor Dawnus has been carrying out preparation work at the site since last autumn. This included installing a 900m long "catch fence" along the bottom of the bank to stop stones and debris falling on the road while the felling takes place. In an effort to minimise disruption, NRW said work would not be carried out on weekends or public holidays. A diversion will also be in place along the A470 through Mallwyd for drivers who wish to avoid the disruption. Proceeds from the felled timber - worth an estimated £500,000 - will be reinvested in the Welsh Government's Woodland Estate. Once the trees have been chopped down, officials say they will let the bank "naturally regenerate" as well as replant some smaller native broadleaf species.